As a mass hunger strike of Palestinian prisoners enters its third week, Israeli authorities told reporters that they are considering bringing in foreign doctors to force-feed the prisoners. The decision, which has not been finalized, comes after last year’s Israeli High Court ruling that force-feeding fits within Israeli law. But even though the Israeli High Court said that it’s allowed, the Israeli Medical Association has banned its doctors from participating in the practice. Force-feeding is considered torture under international law. The United Nations Human Rights Commission has condemned the practice, and the World Medical Association has called for disciplinary proceedings against any doctor or medical professional who participates in force-feeding. The doctors would be brought in from an unspecified country, and would be held in a medical facility of the Israeli Prison Service. 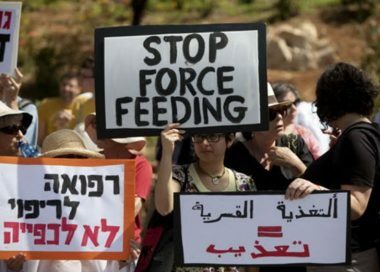 The Israeli government plan to import doctors would break with world medical standards, but the government prefers to carry out the widely-condemned practice of force-feeding instead of considering the demands of the hunger striking prisoners. These demands include visits with family members, access to proper medical care, and an end to the practice of holding prisoners indefinitely without charges. Most of the prisoners’ demands are demands that Israel comply with international law and conventions on the treatment of prisoners. The Israeli authorities are, according to the prisoners, willfully ignoring the provisions and requirements of the UN Standard Minimum Rules for the Treatment of Prisoners, the European Convention for the Prevention of Torture and Inhuman or Degrading Treatment or Punishment, and the Fourth Geneva Convention statute on the treatment of prisoners. The government has not yet announced when the doctors will be imported to force-feed the prisoners. |Force-feeding of Palestinian hunger strikers is a violation of international law and International Humanitarian Law, as argued by the International Committee of the Red Cross (ICRC), by a 2015 joint statement published by the United Nations, and by The Third Geneva Conventions Common Article 3 that is specialized in the treatment of prisoners of war. 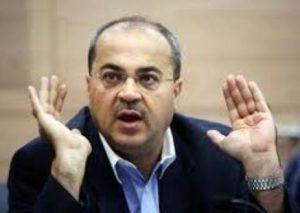 Arab member of Knesset, Dr. Ahmad Tibi, slammed the Israeli government for considering such a move, especially since this comes to avoid dealing with the Israeli Medical Association that rejected being part of force-feeding the detainees. Israel is also anticipating strong opposition, by local medical and human rights groups and activists, in addition to international condemnation. Dr. Nitham Najeeb of the Palestinian Medical Association strongly denounced Tel Aviv for even considering such a move, and considered it an official decision to execute the detainees. He added that hunger strike is a legitimate, internationally-recognized right, and that the detainees have the right to resist the ongoing crimes and violations with their own empty bowels.